The global market for Picture archiving and communication systems (PACS) and radiology information systems (RIS) have witnessed rise at a significant pace in the past few years owing to the efficiency they enable in the proper management of data in healthcare facilities. The mounting rise in demand for digitization in the healthcare industry will continue to drive the market in the next few years as well. Transparency Market Research estimates that the global PACS and RIS will exhibit a promising 7.0% CAGR over the period between 2016 and 2024, rising from US$2.2 bn in 2015 to US$3.9 bn in 2024. On the basis of product type, the global PACS and RIS market witnessed the emergence of PACS as the leading segment in terms of revenue in 2015. The widespread use of PACS and the continuously rising demand across the cardiology and orthopedics sectors are expected to help PACS retain its dominance over the forecast period as well. Of the variety of types of PACS products available in the global market, the segment of oncology PACS is expected to be the segment with the most significant growth over the report’s forecast period. The rising prevalence of a variety of cancers is expected to be the leading factor to drive the increased demand for oncology PACS. From the components perspective, the services segment accounts for the dominant share in the global PACS and RIS market. The demand for PACS and RIS services has significantly increased in the past few years owing to the increased need for the regular maintenance and servicing of software and hardware. In terms of deployment, the market is presently dominated by the web-based segment, owing to the high demand for multi-modality support for the effective management of medical image practice workflow. However, the cloud-based segment is expected to witness the most promising growth over the forecast period owing to cost effectiveness and flexibility provided by the cloud model. From a geographical perspective, the global PACS and RIS market is dominated by North America, which held a share of nearly 45% in 2015. The vast rise in effective healthcare services to tackle the mounting cases of a number of chronic diseases and the substantial rise in government funding to enable this are the key factors to have helped the North America market gain the leading share in the market in the recent years. The PACS segment held the dominant share in the North America market in the same year, chiefly owing to the vast range of applications in the fields of oncology and cardiology. Nevertheless, the PACS and RIS market is expected to witness the most promising growth opportunities in Asia Pacific over the report’s forecast period, chiefly owing to the vast rise in the numbers of medical images and the need to move to a technologically advanced and digitized medical data management systems in the burgeoning healthcare sector in the region. Some of the key companies operating in the global PACS and RIS market profiled in the report are Fujifilm Holdings Corporation, GE Healthcare, Agfa Healthcare, Philips Healthcare, Allscripts Healthcare Solutions, Inc., McKesson Corporation, and Siemens Healthineers. Picture archiving and communication systems (PACSs) has been widely used medical imaging technology for enabling the storing, retrieving, presenting, and the sharing of images produced by a wide variety of hardware medical modalities. Frequently used with radiology information systems (RIS), they have gained traction across hospitals and healthcare systems. Equipped with the capability of managing vast amounts of healthcare data, PACS and RIS technologies, have gained popularity in healthcare IT systems. The market is anticipated to be on the trajectory of exciting growth, fueled by the growing digitalization of healthcare systems world over. The increasing integration of PACS and RIS with ambulatory surgical centers and the development of better, interoperable systems are prominent trends that augur favorably for the market in the coming years. The advent of scalable cloud-based healthcare IT systems have further opened up promising avenues for market players. 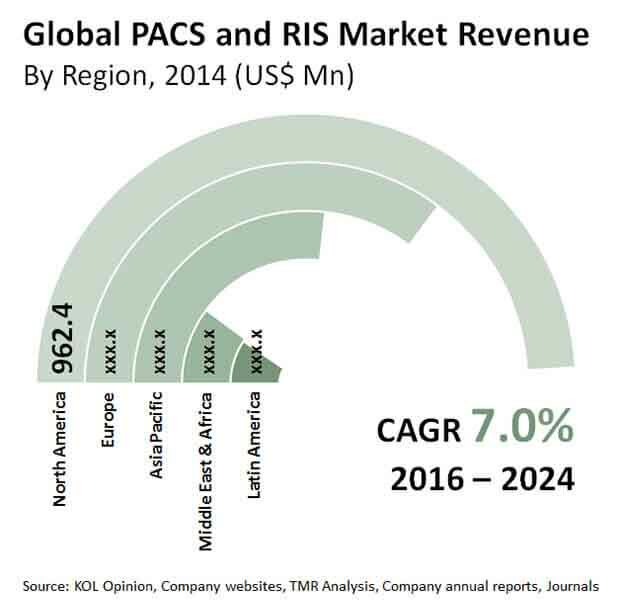 The global market for PACS and RIS is projected to rise at a CAGR of 7.0% from 2016 to 2024. The market is anticipated to reach US$3.9 bn by the end of 2024. The report provides details insights into the key drivers and restraints, the factors driving the prominent segments, regulatory landscape in major regions, recent technological insights, and imminent investment pockets. The research presents an in-depth analysis of market attractiveness to assess competitive rivalry, and uses industry tools such as Porter’s five forces analysis to evaluate the bargaining power of suppliers and vendors. The intensifying demand for a robust medical imagining technologies for the management of images gathered from various diagnostic imaging devices such as X-ray, CT scan, MRI, and ultrasound is a key factor propelling demand for PACS and RIS. The growing adoption of picture archiving and communication systems in a number of medical specialties, including cardiology and oncology, is a prominent trend boosting the market. The increasing prevalence of various cancer types is a key factor stimulating the demand for PACS in oncology to facilitate diagnostics and treatments. In addition, the rising popularity of multi-modality support for streamlining medical image practice workflows in several hospitals and healthcare systems is a crucial factor catalyzing the market growth. The rising initiatives by several governments in various developing and developed regions for the adoption of electronic health records (EHRs) is a key trend accentuating the demand for PACS and RIS. Constant advances made in hospital information systems and the intensifying demand for a consolidated platform in emerging economies are key factors expected to unlock exciting opportunities in the coming years. Furthermore, a number of healthcare providers are actively upgrading EHR to make the system more patient-centric. The development of a flexible cloud-based PACS is a key factor boosting the market. In addition, recent advances made in cloud cybersecurity has progressively improved the uptake of PACS and RIS technologies among caregivers. Geographically, North America led the global market in 2015. This is primarily attributed to the presence of a robust healthcare systems to tackle a rising incidence and prevalence of chronic diseases. The vast rise in government spending in various developed nations in the adoption of an integrated PACS systems has catalyzed the growth. Furthermore, extensive applications of PACS technologies in oncology and cardiology have helped the regional market to emerge as dominant in recent years. On the other hand, Asia Pacific presents lucrative growth avenues for numerous market players and is predicted to rise at the leading CAGR during the forecast period. The growth of the regional market is anticipated to be fueled by rapid advances in healthcare IT systems toward digitization and the proliferation of images from various medical specialties. Some of the prominent players in the PACS and RIS market are Siemens Healthineers, McKesson Corporation, Allscripts Healthcare Solutions, Inc., Philips Healthcare, Agfa Healthcare, GE Healthcare, and Fujifilm Holdings Corporation. The market is to a large extent competitive and consolidated, with the probable exception being the landscape in developed countries, which is characterized by a high degree of fragmentation.